It has been a while since I have made a frittata and last weekend I found myself with little bits of this and that: half a sweet potato, a bag of baby kale, one small shallot and a zucchini. I decided to indulge myself and made this delicious version of one of my favorite breakfast treats. What I love about frittatas is how versatile they are. As long as you have the eggs you can throw pretty much anything into them and they always come out delicious. If you want more ideas, click on the Frittatas label link to the right. For this particular frittata I quartered and sliced the sweet potato and sauteed it in a twelve-inch skillet over medium high heat in olive oil for a few minutes before adding some chopped shallots. When the sweet potatoes were just getting tender I added the zucchini and cooked that for about five minutes, and then I threw in the chopped baby kale. While the vegetables finished cooking I cracked 8eggs into a bowl, added some salt, and whisked them together. When the vegetables were done I added a small amount to the eggs and stirred to temper them, then dumped in the rest. I wiped out the skillet and returned it to the medium-high heat. I added a tablespoon of butter (for flavor). Once it had melted and was foaming I poured in the egg mixture and lowered the theat to as low as I could get it. I cooked it for about 20 minutes, checking after the first 10, until the eggs were just set and still wiggly on top. I grated about 2 ounces of provolone cheese while the eggs were cooking. I slipped my super duper aluminum handle over the skillet handle and sprinkled the grated cheese over the still wet top of the frittata. 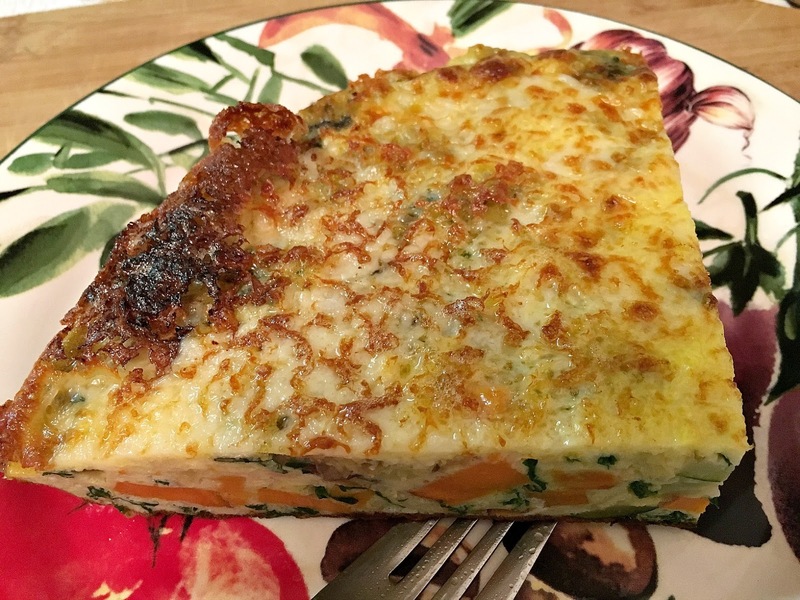 I put it under the broiler for about 2 minutes (checking after the first minute and every 30 seconds after that), until the frittata was set and the cheese had browned. I removed it from the oven and let it sit for a few minutes before serving. The next time you want to treat yourself to a beautiful breakfast take a look through your refrigerator for vegetable odds and ends. I think you will be surprised at what you find, and you will be eating a delicious frittata in no time.